Emotional tributes have continued to flood in since last week’s sad passing of Scarborough Athletic chairman Dave Holland. As well as derby rivals Tadcaster Albion generously donating their match proceeds from an Evo-Stik fixture to Holland’s family, a number of other clubs paid their respects with minute’s silences. Social media also lit up with a number of people from across the game of football paying tribute. Boro striker Jake Hazel said: “The word hero gets thrown around too much in football. “But IMO Dave Holland really was that. “The moment I joined the club he was on the phone telling me the plans for next season and what he wanted from the rest of the season. “His enthusiasm and love of his club is admiring. Bridlington Town chairman Pete Smurthwaite added: “Myself and all connected with Bridlington Town send our sincere condolences to Wendy and the families. “I had regular contact with Dave in recent years since he took over as chairman of Scarborough and always found him to be helpful, polite and to have great integrity always wanting to do his best for Boro. “Despite the rivalry between the clubs there was never a bad word between us and we always reached an amicable solution. 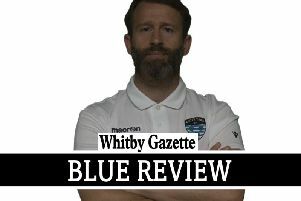 “The return to Scarborough will be a fitting tribute to Dave Holland, Richard Adamson and my old friend Brian France who between them put so much effort into the running of the club since it was reformed. “I know Dave recently thanked me and our club for helping Boro since the club was reformed but I can only add it was a pleasure to work with Dave who was a true gentleman and football person. Former Boro chairman Simon Cope said: “Awful news from Scarborough Athletic regarding the sudden death of chairman Dave Holland. “The club owes him a great deal for his work. RIP. There were also tributes from Boro fans on our website. Meggo72 said: “I spoke to Dave in length for the first time at Prescot away this season and he was very honest and open about players, the new ground, international clearance etc. “Since then at away games he’s always said hello and actually come and updated me on our previous conversations. “I thought that showed real class. Thanks for all your hard work Dave and I’m only sorry our conversations will not continue. God bless. Filey1 said: “I was stunned to hear the news that Dave had died. “Very very sad, to think he will not see Weaponness is absolutely unthinkable. “A true Seadog with only the club and its future at heart. “I first met Dave back in January 2005 away at Dagenham with my son Jamie. “We had been chatting here and on email about all things Boro and have always continued to chat at every match. Dave always had time to chat to everyone, and has had one of the most unenviable tasks during recent times. IamradioAnt said: “I remember meeting David few years back in a Scarborough public house. “We discussed the future of Scarborough Athletic. You could see the passion he had in his eyes. “His main goal was to get Boro back home that was always his main goal, I think this is what’s so hard to take. Dave’s funeral will take place at the East Riding Crematorium on Monday at 1pm. There will also be a celebration of his life at the White Lodge in Filey afterwards.